Тема в разделе "СКАМ", создана пользователем NikNak, сен 9, 2018. Наша основная цель — создание максимально возможной прибыли для наших инвесторов при минимальных рисках. Мы предлагаем вам присоединиться к перспективной платформе и начать зарабатывать вместе с нами! 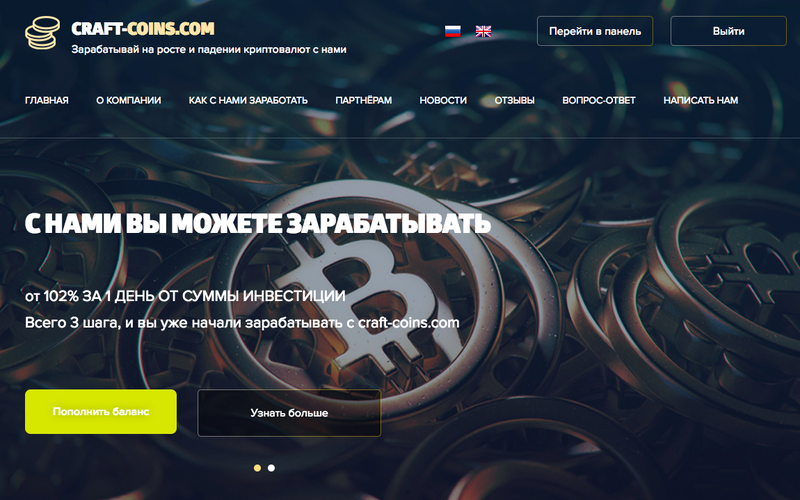 Деятельность, основанная на трейдинге криптовалют на криптовалютных биржах и бинарных опционах — это весьма прибыльный бизнес, на данный момент криптовалюты самые волатильные и на них можно хорошо заработать, а их число постоянно увеличивается. 09.09.18 15:54 Account Transfer -200.00 Sent Payment: 200.00 USD to account U17975569 from U4731311. Batch: 227748060. Memo: Shopping Cart Payment. Deposit user monitorinvestnet craft-coins.com . 09.10.18 17:17 Account Receive +6.2 Received Payment 6.2 USD from account U17975569 to account U4731311. Batch: 227877334. Memo: API Payment. Withdrawal user monitorinvestnet craft-coins.com. 09.11.18 10:49 Account Receive +0.18 Received Payment 0.18 USD from account U17975569 to account U4731311. Batch: 227954010. Memo: API Payment. Withdrawal user monitorinvestnet craft-coins.com. 09.11.18 20:44 Account Receive +1.77 Received Payment 1.77 USD from account U17975569 to account U4731311. Batch: 228022832. Memo: API Payment. Withdrawal user monitorinvestnet craft-coins.com. 09.11.18 20:44 Account Receive +2.22 Received Payment 2.22 USD from account U17975569 to account U4731311. Batch: 228022824. Memo: API Payment. Withdrawal user monitorinvestnet craft-coins.com. 09.12.18 21:52 Account Receive +2.2 Received Payment 2.2 USD from account U17975569 to account U4731311. Batch: 228151167. Memo: API Payment. Withdrawal user monitorinvestnet craft-coins.com. 09.14.18 16:57 Account Receive +4.00 Received Payment 4.00 USD from account U17975569 to account U4731311. Batch: 228359952. Memo: API Payment. Withdrawal user monitorinvestnet craft-coins.com. 09.15.18 20:39 Account Receive +4.29 Received Payment 4.29 USD from account U17975569 to account U4731311. Batch: 228489346. Memo: API Payment. Withdrawal user monitorinvestnet craft-coins.com. 09.16.18 19:03 Account Receive +4.3 Received Payment 4.3 USD from account U17975569 to account U4731311. Batch: 228582345. Memo: API Payment. Withdrawal user monitorinvestnet craft-coins.com. 09.17.18 20:35 Account Receive +4.00 Received Payment 4.00 USD from account U17975569 to account U4731311. Batch: 228716971. Memo: API Payment. Withdrawal user monitorinvestnet craft-coins.com. 09.18.18 19:47 Account Receive +4.00 Received Payment 4.00 USD from account U17975569 to account U4731311. Batch: 228842558. Memo: API Payment. Withdrawal user monitorinvestnet craft-coins.com.